The years 2010 until 2020 are included. No hidden In-App Purchase. The Big Lunar Calendar shows you which activities are supported by the moon every day. Do you want to know when to start a diet or visit the hairdresser? 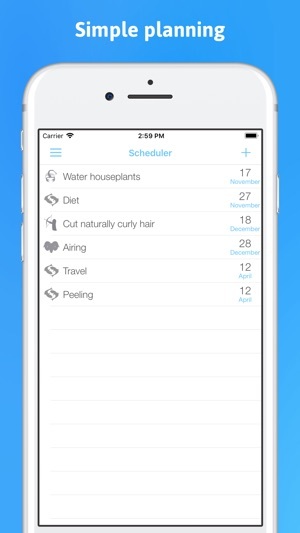 The beautiful planer lets you choose between 120 different activities. Do you want to know how the moon affects your birthday or any other special date? 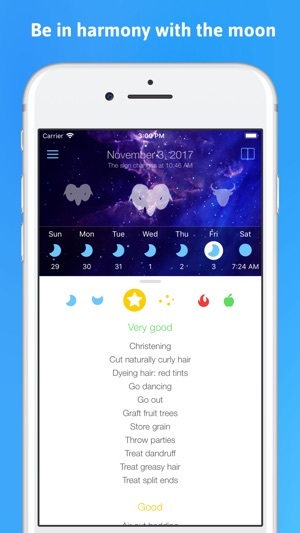 The calendar lets you see detailed information about every day of the year. Bookmark activities, dates, help texts and much more with the easy accessible bookmarks page. Synchronise your planed events with your iOS calendar and receive Notification badges. Do you want to dive deeper into the secrets of the moon? The help texts are just a tap away. The date was correct but the day of the week was wrong by one day. Deleted the app right away. Please contact support. This issue should be fixed in the newest version. I love having the lunar phase on hand for planning appointments from dental to hair to mechanics! This app shows all phases of moon, zodiac sign it's transiting and/or the void. A really useful feature includes the exact time of new and full moons! In addition to planting and pruning schedules, best days for cleaning a variety of items and best times for starting to diet, and exercise. I gave it 4 stars because I wish it included best days for hosting company or a party, best days for romance, and best days for giving presentations too. Also to have the solstices and equinoxes identified would be great! The beautiful graphics make it pleasing to visit often. No music to tire of, plus keeps it private too! So far I'm happy with this but just Learning how to incorporate this app in my life, I'm able to download activities in my calendar that would best be suited according to the moon phase. It makes it easy to see ahead of time. 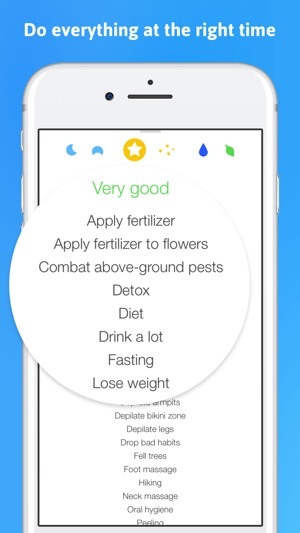 I've never functioned according to moon phases and I'm looking forward to applying it with the ease of this app. So hear goes!